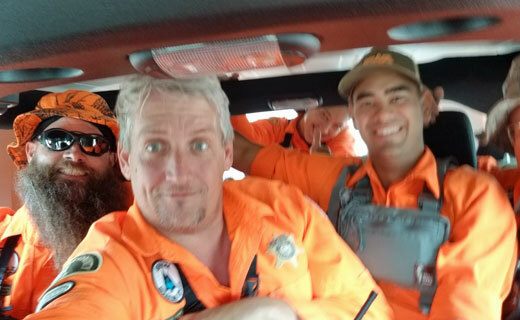 On Saturday, October 6th, the search continued for the flash flood victim in the Box Canyon Road Flood. Tony, Michael, Shani, Eric, Corey, and I all responded at 0700 hours to the command post that had been established two days prior. 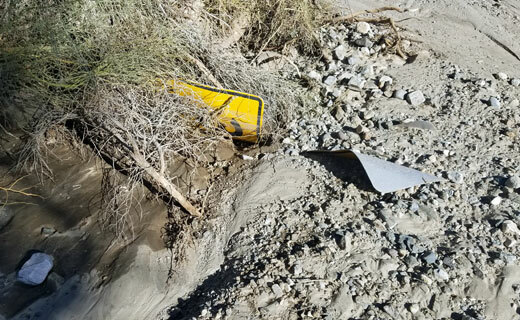 The search effort was bolstered by a mutual aid request through the California Office of Emergency Services, which brought search and rescue teams from throughout California. Search and Rescue Teams from Riverside County, San Bernardino County, Imperial County, San Diego County, Orange County, Los Angeles County, and Kern County, along with assistance from the Bureau of Land Management. Additional resources included ground search teams, off-road vehicle searchers, helicopters and fixed-wing airplanes from the sheriff’s department and the California Highway Patrol, the sheriff’s department dive team, numerous search canine teams, and various specialized equipment from the Sheriff’s Department Hazardous Device Team. That equipment included ground penetrating radar and excavation heavy equipment. The Joshua Tree Search and Rescue family support unit assisted in providing resources to Mr. Goyal’s family. After a quick briefing, the teams were divided and given search assignments. Team High Ground consisted of Eric, Shani, Corey, Joe (a member of DSAR), and I. 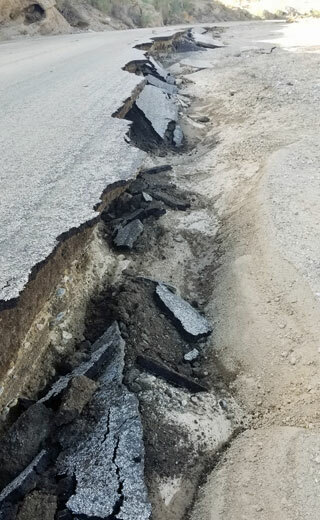 The task for this group was to drive to the beginning of the canyon, to the point where the road remained intact. Once at this point, this team was further divided into two additional teams. Shani, Joe, and I searched along the western ridge of the canyon while Eric and Corey searched the eastern ridge. During this time, we were looking for any tracks or evidence that the victim might have tried to escape the flood to reach higher ground. This also allowed us to look from a higher vantage point into the canyon as we continued to look for the victim. 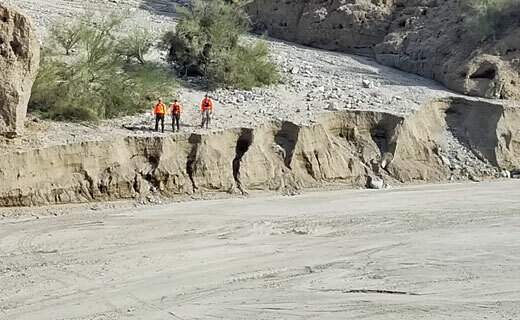 During this time, Tony and Michael assisted other teams as they continued to look for more evidence within the lower parts of the canyon. During this search, nothing of interest was found. After both areas were covered, RMRU members returned to the command station at around 1200 hours and received a second assignment. 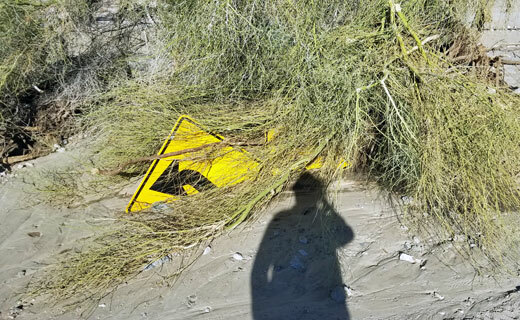 To the south of the canyon, following the path of the flood, there was a large debris field. Michael, Tony, Corey, Eric, Shani, Joe, and I went to this debris field and began to search. We conducted a line search to accurately cover the area. The debris field itself was about 1-3ft deep in some areas, covered in soil, trash, fallen logs, and other decaying plant material. During the search of this debris field, the only notable things that were found were some car parts that could have been from the victim’s vehicle. After conducting a search of the field, this team continued to search around a few ponds that had been left by the flood a little east of the debris field. Again, this search did not find anything noteworthy. We returned to command and relayed this information at 1400 hours. Numerous items related to the vehicle were located throughout Box Canyon. Mr. Ankit was not located during the search. The ground search was suspended on October 6, 2018; however, other search efforts will continue. RMRU Members Involved: Corey Ellison, Michael George, Glenn Henderson, Eric Holden, Tony Hughes, Kaitlyn Purington, Shani Pynn, Alex Rilloraza, and Gwenda Yates.